The Tauranga Bridge Congress was played over the weekend of 28-30 January and Tom Winiata and Tom Henwood’s team qualified for the final of the teams event where they finished second. Pam and Ian Moore’s team qualified for the plate final where they too finished second. These were good results in a very strong field from all around NZ. 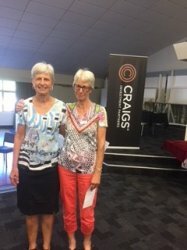 On January 6th and 7th Kerikeri hosted a two day event sponsored by Craigs Investment Partners. Marie Milsum teamed up with her partner of old, ex-Rotorua player Alison Beer to play in this and they won the Bay Of Isands’ Holiday Pairs, held on the Sunday, (as well as being also runners-up in the Swiss Pairs on the Saturday), rounding off the day with a whopping 71.27% ! Many people from all over the country attended this popular event, so well done to Marie and Alison! Obviously distance hasn’t affected their partnership.